This fantastic sculpture is stationed at the entrance to the resort. On our recent trip down South, one of the highlights was visiting the Florida Carriage Museum. I’m already trying to figure out which of my horses will learn to drive this spring. I’m thinking Zelda. There were many large pastures (and beautiful horses). 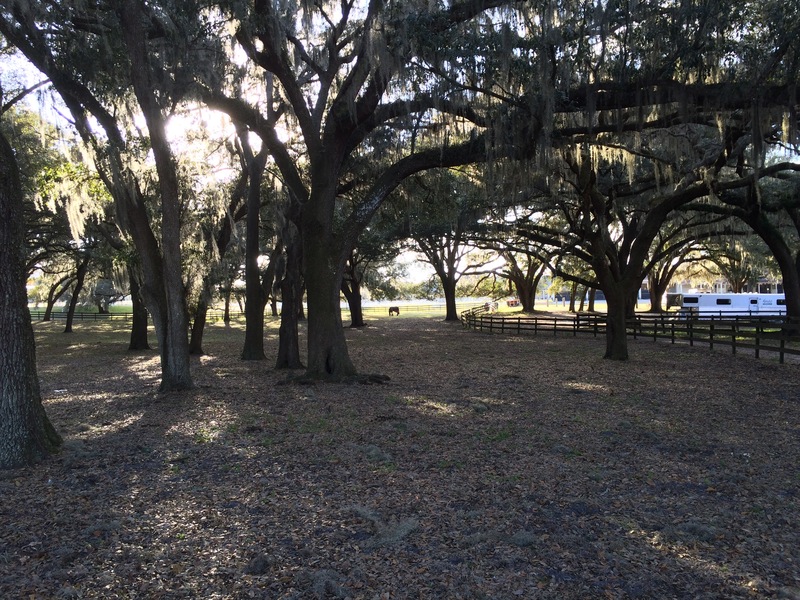 The Grand Oaks and Spanish Moss provided natural canopies of shade. The Carriage Museum is located at the Grand Oaks Resort. That alone is worth a visit. 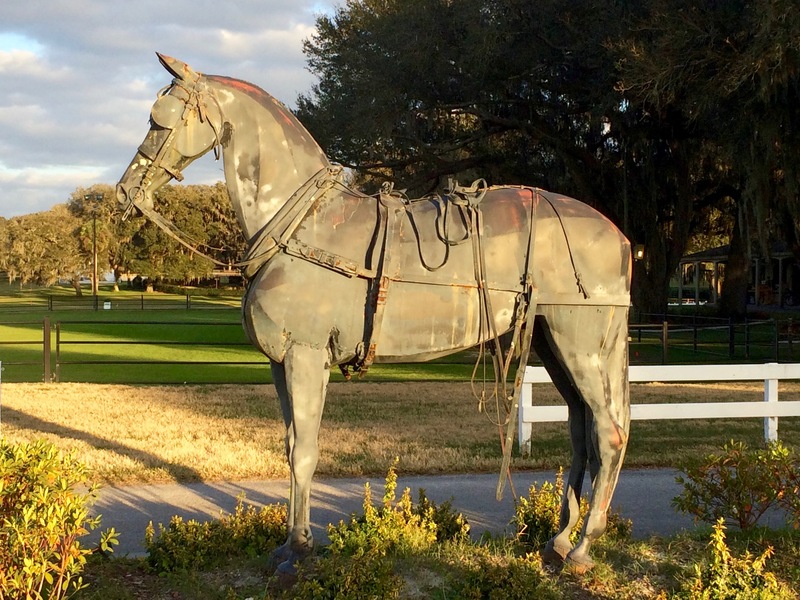 The grounds are spectacular — picture oaks dripping with Spanish Moss, beautiful pastures and six rings large enough for driving — and every few minutes a horse and carriage trots by. We had a great time exploring the grounds. The Museum features a collection compiled by Gloria Austin, an equestrian, internationally renowned carriage driver and philanthropist. After winning many championships with her horses and carriages throughout the United States, Canada and Europe, she was determined to share her knowledge of driving and its history with others. The museum is spectacular. It has more than 150 vintage carriages that have all been immaculately restored. The carriage was shipped to Europe for restoration. Amazingly, after many months of painstaking work, when it was shipped back to Miami, the carriage was “misplaced” and was missing for several days. If it weren’t for lack of a cup of tea, the crown jewel of Gloria Austin’s collection may never have been acquired. 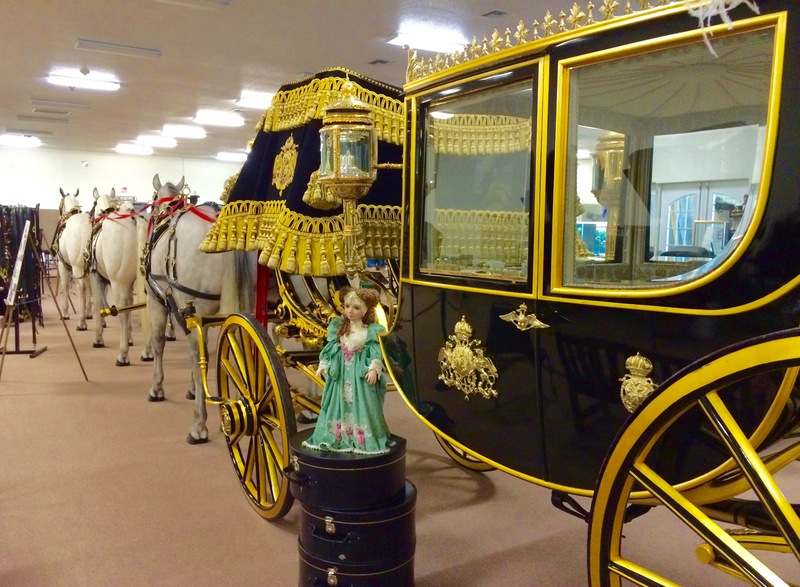 The centerpiece of the Florida Carriage Museum is a one of a kind royal state carriage dated to 1850. Also known as a full dress chariot, or Gala Coupé, it once belonged to the Emperor Franz Joseph, of the Austro-Hungarian empire. It was during this time that David Saunders was working with Gloria, helping her to put her collection together. For this particular excursion, they’d traveled to Oregon to purchase a Brewster summer coach; what would become the first coach in Gloria’s collection. Even the horses in the exhibit are amazingly life like, with slight differences that make them more realistic. These horses are Kladrubers. 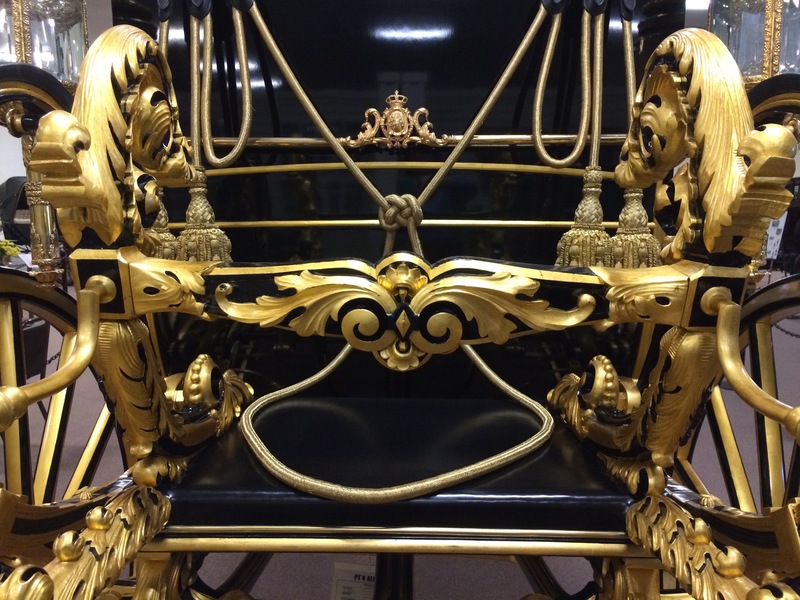 The carriage has been completely restored, including the gold leaf and the gold thread in the tassels. It would be another two years before Gloria would own this amazing coach, but at the time she purchased it, “amazing” took quite a bit of imagination. “Almost all of the woodwork was rotten”, David Saunders remembers vividly, “A lot of the ironwork was there but it wasn’t in particularly good shape. It had been purchased originally in the 1930’s by a Hollywood movie studio for use in a Ronald Coleman movie called; The Prisoner of Zenda”. The carriage can be seen briefly about forty-five minutes into the 1937 film. The Gala Coupé makes its appearance during the climax of the coronation scene and is easily recognizable (even in the YouTube clip). 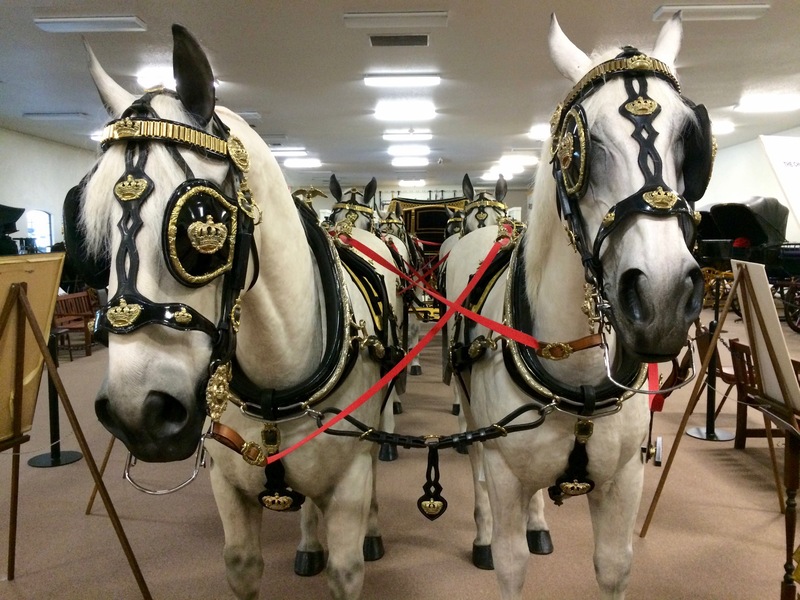 Pulled by six light grey horses, and driven Postilion, the carriage looks almost as good in the film as the magnificently restored version of itself that’s on display in the Florida Carriage Museum today. No one knows how the carriage originally made it to the United States, but if it hadn’t ended up in that barn, it might have been lost forever.